After the combined efforts of corporate media succeeded in scaring off Scottish voters from independence, the establishment breathed a sigh of relief that was so loud that it still reverberates in the corridors of corporate headquarters and presidential palaces. 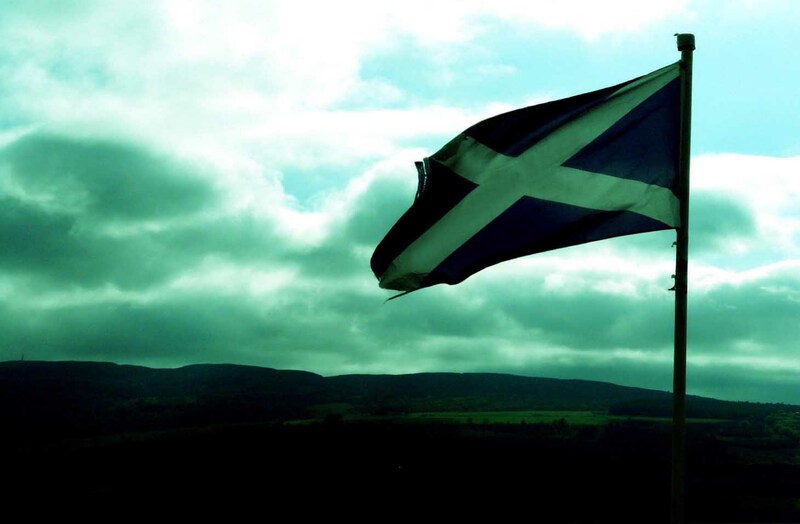 The Scots were told, that an independent Scottish government would face huge economic costs. It would inherit its share of UK public-sector debt and future liabilities without the benefit of the substantial subsidy that it currently receives from the British Treasury. The SNP (Scottish National Party) claims, that additional revenues from North Sea oil would offset the subsidy, were dismissed by the argument of large decommissioning costs which would arise when the oil ran out (which is of course true for any kind of resource extraction but usually ignored and left to the concern of further generations). The Scots were told, that an independent Scotland would face higher currency policy risk by having no representation in the UK Parliament and the HM Treasury, institutions that influence currency and therefore economic policy. Scots would need their own currency and no British lender of last resort would be available to Scotland’s banks. Scotland was threatened with the loss of British defense contracts and powerful corporations mulled publicly a possible relocation of production lines and layoffs. LLOY (Lloyds Banking Group PLC) and RBS (Royal Bank of Scotland Group) made headlines when they announced plans to move their headquarters from Scotland to England in the event of a Yes vote. Homeowner were told, that mortgages would become more expensive and house prices could fall in case of independence. Blatant manipulation was exposed when BBC’s political editor Nick Robinson published a highly edited press conference by Scottish First Minister Alex Salmond. Robinson had asked Salmond a two-part question about claims by company bosses and bankers, that independence would damage Scottish economy. When Robinson claimed, that Salmond refused to answer his pointy question, hundreds of thousands had already watched the unedited clip on the internet, where Salmond gave the reporter a run for his money. According to the rules governing the referendum, the UK and Scottish governments were forbidden from publishing anything which might affect the outcome during the so-called “purdah period” of 28 days leading up to September 18. Thus, an announcement setting out a timetable for enhanced powers was completely above board and not at all designed to influence the very close vote on independence. This was establishment sophistry and a deeply cynical manipulation of the voters. 1. Britain, the most reliable ally of the USA, would have been greatly diminished in her ability to support military and political interventions. 2. Independence movements in Europe and around the world would have been encouraged, making it more difficult to control and exploit peripheral areas. 3. Central governments would have had to care more about regional grievances and the plight of minorities. 4. Media manipulation and propaganda would have been disproved, media consumers would have become more critical and doubtful. The separatists in eastern Ukraine could have based their claims on the Scottish precedent. Novorussia (eastern Ukraine) seeks an independent status, which would hinder attempts to explore the shale gas fields, make the nationalization of Akhmetov’s industries possible, and create a buffer zone between NATO and Russia. The in 1992 declared republic of Transdniestria would have gained legitimacy, complicating Moldova’s integration into NATO and the EU. The same applies to the Georgian regions of Abkhazia and South Ossetia. Several independence movements in Italy would have been revitalized. Venice, one of the countries most romantic and visually stunning cities, declared that it wants to break away. Venice and the surrounding Veneto area used to be an independent republic until the region became a part of Italy in 1866. Lombardy (northern Italy), the most prosperous Italian region, also seeks independence or at least more autonomy. The ongoing dissolution of Belgium would have been accelerated. The Dutch-speaking Flanders region in the north has aspirations to break away from the poorer French-speaking Walloon region in the south. The New Flemish Alliance, a party that wants to split Belgium along linguistic lines, became Belgium’s biggest party in the 2010 federal elections, and it stormed to power in Flanders’ municipal elections in October last year. The party has pledged to achieve self-government, through independence, if necessary. The Catalan self-determination referendum in November, which at the moment is declared as illegal by the Spanish government, would have gained weight and it would not have been easy to dismiss it outright. 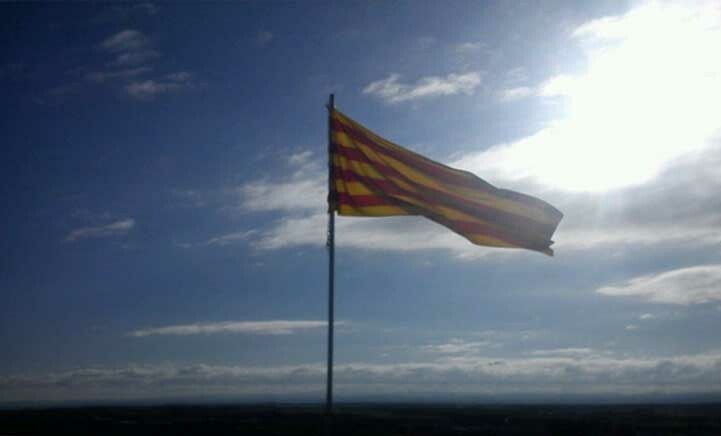 Catalonia has its own unique language, culture, cuisine, and architecture, it represents one fifth of Spain’s economy and has its own parliament, police force, and control over education and health. The secession movement has been growing constantly for decades and has been invigorated by Europe’s economic crisis. On September 11 hundreds of thousands of people took to the streets of Barcelona for the third year in a row, demanding the right to vote on independence. The Basque region on the border between Spain and France also has long sought independence. The Basque independence movement has been characterized by violence in the past. ETA, the primary Basque separatist and independence movement, became notorious for its terrorist activities. But in 2011, ETA declared a ceasefire. Spain’s foreign minister, José Manuel García Margallo, warned, that Scottish independence would “start a process of Balkanization that nobody in Europe wants” (he didn’t explain, whom this “nobody in Europe” includes). The proverbial Balkanization to which Margallo referred is indeed a warning example. The breakup of Yugoslavia during the early 1990s occurred as a result of ethnic and social divisions, exploited by Western powers, and resulted in bloody wars primarily in Bosnia and Croatia. One by one the Yugoslavian republics proclaimed independence. The Reagan administration had specifically targeted the Yugoslav economy since the 1980s, Western NGOs and undercover agents had stirred up discontent and animosities. The partition was finalized with the NATO bombing campaign in 1999 and the toppling of Slobodan Milosevic in 2000. This breakup was ignited by external forces as part of a geopolitical plan and it cannot be used as a warning example against independence efforts. There are examples of more or less peaceful partitions which didn’t result in bloody conflicts, for instance the independence of Norway from Sweden in 1905, the dissolution of the USSR in 1991, the separation of Czechoslovakia into the Czech Republic and Slovakia in 1993. Some independence movements (Catalonia, Lombardy, Flanders) are not only driven by cultural, linguistic, political, and economic specificity, but also by less than noble motives, especially the desire not to pay for poor and disadvantaged regions of a country. The problem of regional selfishness and narcissm can only be solved if the paramount social paradigm, which for now favors competition over cooperation, private wealth over the common good, individual freedom (egoism) over compassion and social responsibility, is profoundly changing. But that is a discussion for another day and another blog post. All is not lost, but…. The Scottish separatists won concessions on austerity and local autonomy, which were effectively bribes from England to buy votes. In this regard the independence movement scored important gains for Scotland despite the ballot loss, though it has yet to be seen if the last minute promises of the British party leaders, made in a desperate move to scare off Scots from a Yes vote, will be fulfilled. Britain and Spain could reluctantly follow the lead of Belgium, which came to its end as a unitarian nation in 1993 and is now a federation with autonomous regions, autonomous communities, and a dispossessed central state. Belgian regions can even sign international agreements regarding competencies considered as their own. The Flemish and the Walloon region enjoy nearly complete international sovereignty, almost making a puppet of the Belgian state. Which leads to the curious situation that the city of Brussels has steadily lost importance as the capital of Belgium while it at the same time gained statue as the de-fact capital of the European Union. Many genuinely alternative thinking and social responsible people supported European integration because they hoped that a united Europe could be a counterweight to US-American dominance. They soon discovered that the EU bureaucrats in Brussels were in cahoots with the global corporations and with the US-Israel-UK axis and the EU had become the political wing of NATO, proven beyond doubt when the EU got the Peace Nobel Price on behalf of NATO for the destruction of Gaddafi’s Libya. The EU was a nice idea 60-odd years ago, but it inevitably fell into the hands of the plutocratic cabal, and there was never any democratic feedback built into the system. Brussels has snatched additional power all the time until it became more powerful than its member states (with the exception of Germany). 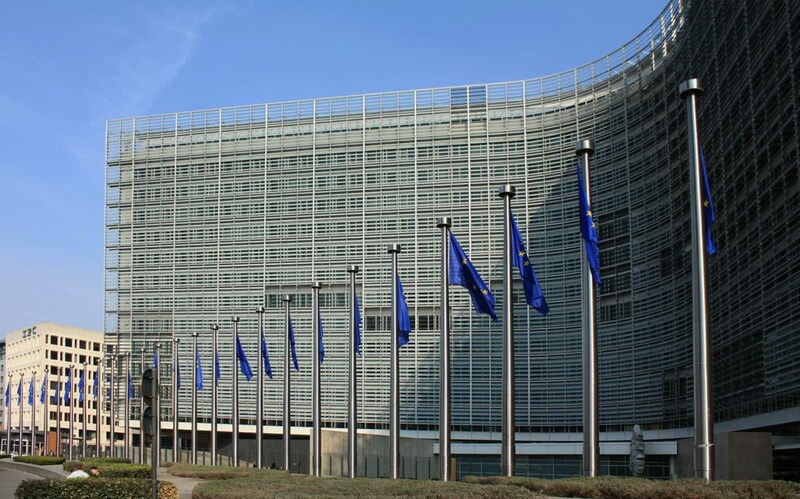 Voters in European nations may still have a token influence through their national ballot boxes and the European Parliament, but the big decisions are made by the bureaucrats in Brussels. There is no longer a choice available to reject Brussels, or reject the Euro, or reject what either the ECB (European Central Bank) or the European Commission — both of which are extremely “light” on democracy — dictate. The Europeans not only became disenchanted with the EU, they also found out that the benefits of globalization (cheap consumer goods, food, fuel) didn’t come without a price. The price was an erosion of cultures and identities, a declining sense of community, wage stagnation, rising inequality, and uncontrolled banks. The outsourcing of production lines caused unemployment, tax evasion decreased state funds, exploitation abroad (sweatshops, mining, land grab) brought misery to millions of people (many of them becoming economic refugees which flooded the shores of Europe), industrial pollution, though initially far away in developing nations, came back home after time with a vengeance. The question whether people can enjoy the benefits of globalization while being sheltered from its costs is closely related to the discussion about alternatives to the “market fundamentalism” which has defined capitalism now for a century. Anyway, the people in the developing world never saw much benefits of globalization. They were glad to get work in the sweatshops, but only after the local trades and crafts were ruined by cheap imports and their rural communities were destroyed by big industrial projects, mining, by land grabs, clear-cutting of forests, and industrial farming, causing them to migrate into the slum areas of the big cities. The global economic support systems, the mass production of consumer goods in gigantic factories, and the worldwide distribution are justified with the “economies of scale” (the cost advantages that enterprises obtain due to size, output, or scale of operation), while the costs of transport and distribution systems are ignored. Technological advances, especially computerized container shipment and RFID tracking, has brought costs down and made transport very efficient in theory, but the merciless battle between producers, shipping companies (A.P. Moller – Maersk, Mediterranean Shipping Company, CMA CGM, Evergreen Marine), and distributors (WalMart, Target, Aldi) causes huge losses and negates all savings that technology brought. The production of big quantities also means, that special needs of small local markets and small groups of consumers are not met. The users have to adapt to the product, they have to get used to the Anglo-American mindset, and they better learn English, because that will make it easier to use mass produced products appropriately. 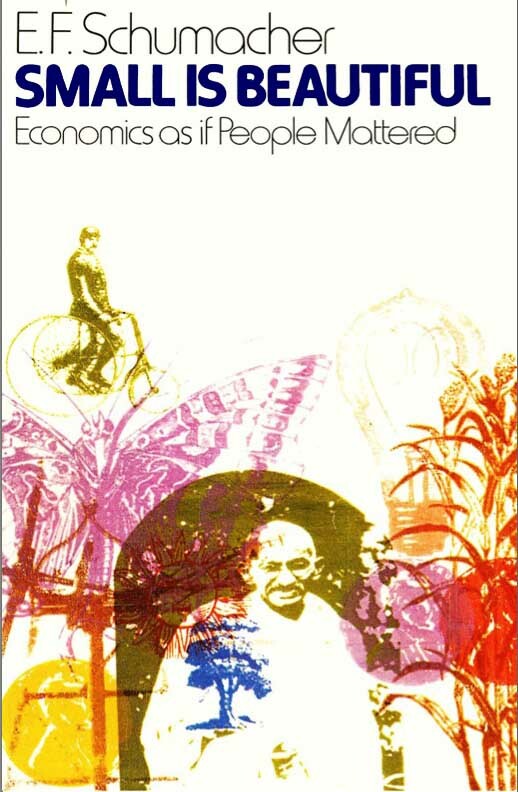 Small Is Beautiful: Economics as if People Mattered, the in 1973 published seminal book of E. F. Schumacher, is a magnificent collection of essays at the intersection of economics, ethics, and environmental awareness. The book is nothing less than a masterwork of intelligent counterculture, applying history’s deepest, timeless wisdom to the most pressing issues of modern life in an effort to educate, elevate, and enlighten. The idea of small being beautiful keeps reappearing because it incorporates a fundamental insight into the human experience of modernity. We yearn for an economic system within our control, within our comprehension, a system that once again provides space for human interaction — and yet we are constantly overwhelmed by centrally controlled forces and find ourselves trapped into vast global support systems that are corrupt and corrupting. 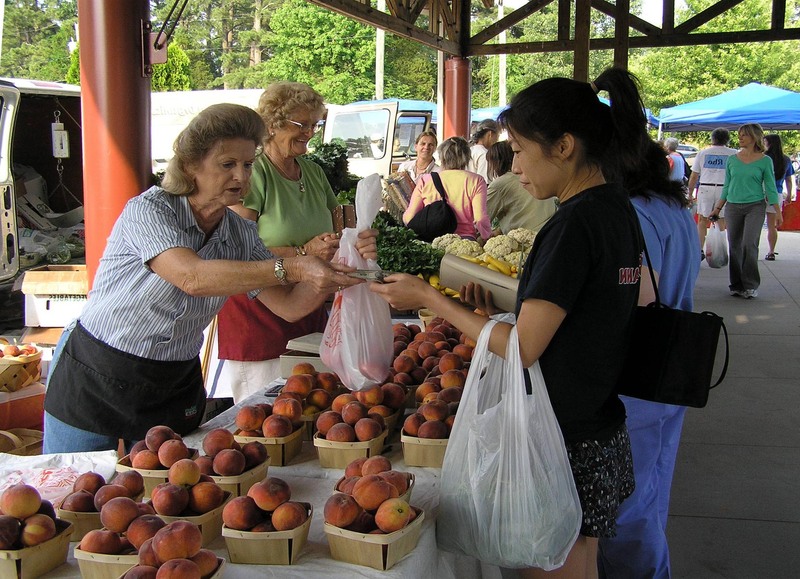 Small is beautiful, this idea reappears again and again in incarnations like farmers’ markets, time banks, co-ops, counter currencies, credit unions, barter and garage sales, transition town movements, neighborhood councils, and the big area of the informal (black) economy. Small is beautiful, and smaller autonomic entities in general should be favored to big organizations because they are more transparent, their structures and inner workings are more understandable, and they cannot as easily be highjacked and corrupted by the moneyed elites. National independence should trump globalization, a federal state is the preferable political structure, decentralization should be demanded and supported at every level, regional and local independence should be increased. The big problem in this strategy is the weakness of small communities against powerful predators (corporations, rich individuals, organized crime) and the weakness of small states against a threatening behemoth like the US imperium. The obvious solution would be a loose confederation of states or a federal structure which gives the states enough autonomy to fulfill regional aspirations. Incidentally the USA is not far away from this model, the European Union could morph into such a confederation, the decentralization of big countries like China, Russia, India could turn them incrementally into confederations. Another solution would be a military alliance of small states and an integrated defense policy. NATO could be such an alliance but as it is dominated by the USA it serves only the aims of US imperialism. More political, social, and economic independence for regions and municipalities will solve some problems but it is not the universal solution for the ills of society. As mentioned before in this text as well as in earlier blog posts, substantial changes of the social paradigm will be needed to improve our lives, decrease inequality, end suffering, and guarantee the long term survival of humanity.